Looking for a way to share your internet t-shirt business with friends or people you meet? You might want to consider creating a new profile card now available at Zazzle. You can get your profile/business cards in 11 different paper finishes, three different sizes (skinny, chubby and traditional), two sided and full color. 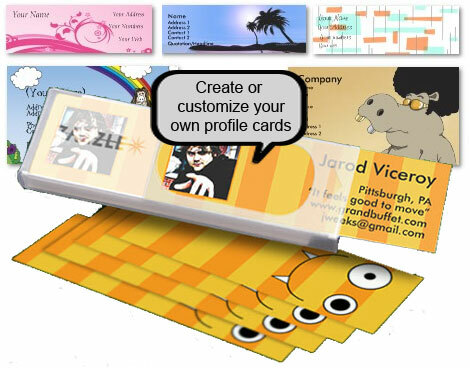 Right now there are over 1,500 pre-designed and customizable profile cards. As with all of Zazzle products your profile cards will ship in 24 hours. They say no minimum order but you have to buy a pack of 20 for $6.95. It is actually a pretty reasonable price and you aren’t limited by base templates. 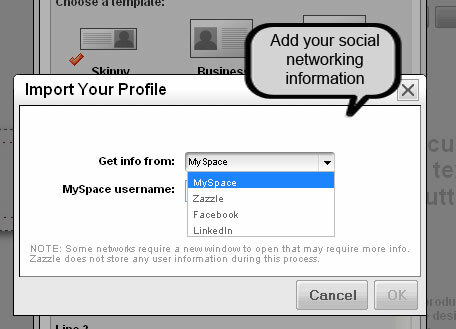 You can also add your profile information from Facebook, LinkedIn, MySpace or Zazzle. Read more about the profile cards on the Zazzle Blog. Terrific idea! I’m sure it will be a success! The skinny profile is great for young people too!